Prominent & Leading Manufacturer from Rajkot, we offer white master batch, color master batch and additive master batch. Dolphin maintains more than 100 White Master Batch formulations, some containing up to 80% pigment. Applications for Dolphin white masterbatch range from trash and t-shirt bags to high-quality specialty applications such as, extrusion coating, molding for food contact, medical devices, and products for photographic applications. Master Batch containing weathering grades of TiO2 is also available for outdoor applications. The range of Polypropylene Fabric Color Master Batch made available by us in the market is known to be amongst the finest that are available. Making of this range is done in compliance with the set industry norms and guidelines, utilizing the finest raw materials and modern machines. Owing to this, its finishing, strength and resistance to moisture, is quite high. 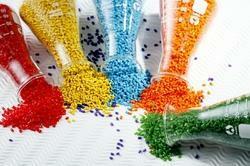 We are reckoned as one of the leading manufacturers of a broad array of Additive Master Batch of Plastic. This range is highly effective in enhancing the quality, strength and overall look of an end product. 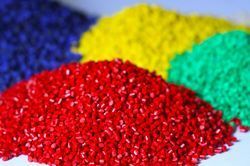 Available in different types of resin variable active ingredient loadings, these master batches are specially designed and developed for use at a suggested addition rate. Looking for Colour Masterbatches ?